There’s something unsavory in taking on very elder statesmen, especially nonagenarians or near-nonagenarians. It seems so uncouth, so unkind, so unfair – just as it would be to slap around helpless little tots or kick cute big-eyed puppies. Therefore, for many months I struggled hard to suppress my inclination to carp – while preparations for yet another sumptuous birthday bash for our phenomenally spry president, Shimon Peres, got underway with fitting fanfare. But even the most stringent self-control has its limits. In the end, I am succumbing to temptation. Why? Maybe because too much sometimes really is too much. There’s a simple acid test for whether all the pomp and circumstance is over the top or not. How would our never-too-objective media react if the birthday boy were not the progenitor of Oslo – the man adored around the globe for having weakened the Jewish state like none of its enemies could? Worse yet, what if the very same garish ostentation were lavished on the man most of our talking heads irrepressibly love to hate – Binyamin Netanyahu? Outraged screams would doubtless reverberate around the planet. Our scandal-mongering press would pull out all stops and passionately pour its scathing scorn on the prime minister whom the public again dared reelect against the admonitions of omniscient opinion-molders. The ad hominem onslaughts would be so merciless that the pilloried premier would rue the day he was born, never mind the party thrown in his honor. But different criteria apply to Peres. Seemingly, he can get away with just about anything. It’s not for the first time either and not because he’ll turn 90 in August (the shindig was scheduled a tad early to coincide with the Presidential Conference, another resplendent get-together that annually glorifies our ceremonial head of state). Dazzling leading lights and eye-popping pop-culture icons were flown here en masse to fete Peres in the past. He is serially not publicity-shy. It was much the same ten years ago. He wasn’t even president then. Indeed he was considered a remarkable political flop locally, but out in the warmth of European cosmopolitan broad-mindedness Peres was already in 2003 a lauded luminary, wined and dined and eagerly courted. On one single summer’s day, he broke bread in a spectacular Lake Como villa with no less than the Austrian, Spanish and Turkish premiers and a host of assorted nabobs. While Peres reassured all present that his futuristic vision of a Mid-Eastern utopia is ever-vibrant, super-model Naomi Campbell entered, clad in a baby-blue original Valentino gown. Straight-faced, Peres groupies later reported that she gushingly revealed that she had serendipitously heard that Peres’ 80th birthday festivities are coming up. Thereupon she “spontaneously announced” that she’d “love to come.” Having been obligingly informed that she’s invited to the extravaganza (in the Mann Auditorium no less), she hesitantly inquired if she can bring a friend along – U2 soloist Bono. See how popular Peres is? It’s not just venerated elder statesmen who crave his company. On that birthday season, affirmative RSVPs arrived from Bill Clinton, Mikhail Gorbachev, Nelson Mandela, as well as the presidents of Germany, Poland and the Ivory Coast, to name but a few. Naomi and Bono obviously added glamour and glitz and showed all and sundry how cool and hip ever-youthful Shimon is. This year it’s pretty much déjà vu. True, some of the names have changed and so has the venue. The scintillating stars chosen to light up our firmament this birthday include Sharon Stone and Robert De Niro. However, the headliner is Barbra Streisand, who has hardly been a frequent flyer to our little land. She was last here, very briefly, 29 years ago (which doesn’t dissuade her from condescendingly preaching to us). No need to list all the notables, celebrities and jet-setters in attendance; suffice it to say that it’s a veritable Who’s Who of international glitterati and literati. Anyone who counts was sent an invitation – from Ramallah figurehead Mahmoud Abbas to former British PM Tony Blair and all the way to US President Barack Obama’s two erstwhile confidants and strategists, Rahm Emmanuel and David Axelrod. And good old Bill Clinton has reprised his old role as guest of honor. Mind you, he didn’t agree altruistically to deliver the keynote address at the Peres Academic Center. The goodness of Clinton’s heart is a big ticket item – a whopper of a big ticket. Clinton’s fee for approximately 40 minutes of schmoozing in front of an open microphone is a staggering $500,000. According to mean-spirited math this comes out to $12,500 a minute. Is Clinton that good, that indispensable to humankind’s insight? Is his kibitzing really worth the outlay? Our natural revulsion was supposed to be soothed with two excuses. The first is that it’s all for a fine cause – Clinton’s own self-aggrandizing charity, the William J. Clinton Foundation. Like we care! Like that makes a difference! The second ostensibly calming tidbit was that we the people wouldn’t directly bankroll Slick Willy. Rather than our tax coffers being depleted, the bill for Bill is to be footed by the Jewish National Fund. Like that makes us care less! Like that makes a difference! Contrary to expectations, we weren’t less bothered to learn that money collected from goodhearted donors both at home and abroad is earmarked to enrich a former U.S. President and/or his NGO. All that discomfited the JNF enough to backtrack, back out and claim that the Peres Academic Center had made all the arrangements. The Center confirmed that its “friends” will pick up the tab and Clinton promised that his foundation will donate to the Peres Center’s scholarship endowments. How very cushy! What does this recycling of fungible funds teach us? Incontrovertibly that love comes at a price. Love has to be bought. It doesn’t come for free. 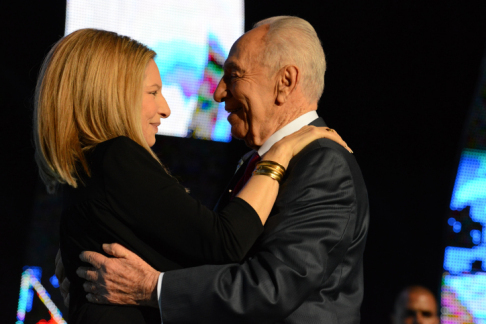 In his own way Peres has been buying the world’s love for ages. The key to understanding this was handed to me by Golda Meir way back, when I was a young cub reporter. She wasn’t taken aback. “It’s easy to win the world’s love,” she intoned. “Just do as they wish. If you don’t they’ll hate you.” She didn’t, and was indeed harshly diagnosed as inexplicably and inexcusably afflicted with the Masada Complex. Over the years, Peres, her nemesis, kept proving Golda’s point with a vengeance. His New Middle East earned him accolades from enlightened international circles. His Oslo project and concomitant Noble Peace Prize made him the darling of the world’s trendiest and most beautiful people. Pleasing world opinion indisputably has its perks. Peres’ popularity is perhaps the only remaining fringe benefit still accrued from the Oslo process. The rest is an unmitigated dismal disaster. It’s not like no one saw what’s coming. Some of us warned and opposed in real time only to be ridiculed and denigrated as Hamas collaborators. We were unadulterated anathema to Peres’ swanky set of overseas cronies and admirers with an agenda. Even less than a confession of egregious error would do in lieu of an apology. Mild soul-searching and an admission that Oslo is dead would suffice. But it’s unrealistic – even now – to expect moral stocktaking and intellectual honesty from the bamboozlers who inflicted Oslo upon us. At most they’re willing to beat Netanyahu’s breast and blame him for their fabulous plan’s predictable breakdown. As per their demagoguery, things would have turned out brilliantly had all settlers been removed and the IDF unilaterally pulled back to Pre-1967 lines – presumably according to the proven Gaza Disengagement model that exposed Israel’s southern half to rocket barrages. Thanks to the Peres doctrine that any deal is better than no-deal, Israel’s reputation among Peres’ beloved Europeans is in dire straits. In pre-Oslo days there was less call for targeted killings, numerous roadblocks, security fences and similar image-tarnishing measures. Still, everyone is at fault with the outstanding exception of the birthday boy’s basic conception that creative solutions can be imposed on insoluble problems, that reckless gambles are preferable to stalemate. Peres purchased the world’s abiding affections by risking the very survival prospects of his compatriots – both individually and collectively. It’s as simple and as sad as that. Peres waived no opportunity to remind Israelis that time works against them. “What’s the alternative?” he ceaselessly inquired whenever challenged, insisting repeatedly that at worst Oslo is the least of the evils menacing us. That was patent misrepresentation, not only in the light of hindsight wisdom. Israel wasn’t beset by mortal existential perils in 1993. Nothing mandated surrender. The PLO leadership resided luxuriously abroad and world opinion grew accustomed to the fact. Tampering with it was incomprehensibly rash. We’re still paying for Peres’ devil-may-care adventurism. His “peace” harmed Israel incalculably more than the so-called occupation he bemoans with European sanctimoniousness, as if he had become a visiting stranger himself, a bit distant from our reality. Oslo turned everything sour, except for Peres’ ever-sparkling celebrity. Although Golda hardly headed a government which Peres could have described as right-wing, she couldn’t dream of the sort of overseas esteem lavished upon him. No wonder there were no gaudy and flashy birthday galas for her – not that she’d have coveted anything of the sort. She plainly lacked Peres’s uncontainable prestige-craving, obsessive love of the limelight and infatuation with center stage. Or, put differently, he plainly was never afflicted with the Masada Complex. Infuriating! Why are we so helpless with this outrage? He seems to think Oslo was all-in-all, a success. There should be someone assigned to write a new article about the Oslo catastrophe at least once a week, so those of us who think he’s a cute old man might get another view. Personally, I am disgusted by the entire adulatory, self-aggrandizing, and mutual admiration session with the Clintons given to Peres. Just what the hell are they honoring him for when what he did was put Israel on a suicide course with the damn Oslo Accords?!!! SHAME ON ISRAEL FOR THIS SPECTACLE AT A TIME OF GREAT DANGER AND ECONOMIC HARDSHIP FOR MANY. NO CLASS, VERY GREASY. The only good thing that has came out of this celebration is, that suddenly everybody in Israel has realized how Peres is despised here. There were no compliments for this celebration even from our media. During his long career Peres won honestly the name of the most negative most distrutive political figure among politicians of his level. He symbolizes all the evil in Israeli politics. Thanks God, during the last week such feelings prevail not only among the general public but even in media. Peres’ infamous “I’m tired of history” crack back in 1994 says it all. Our history, Jewish history, bores him, it has no meaning. We stupid, ignorant, deluded Jews must erase it from our memory and, as deracinated zombies, embrace the end of history, the Marxist nirvana, a world without Jews, here at last and forever more. Ah, the bliss of annihilation! Quite a ghoulish affair, that birthday party, to say the least. Why do some get away with outrageous behavior, while others have to toe the line, 24/7? He knows that as long as his motto is: “I know nothing, I see nothing, I hear nothing,” he’ll continue to get away with his lack of accountability for Oslo. On the other hand, Golda Meir, though not always a great PM, was always a great lady–one of a kind. She took responsibility, and told it like it is. (was) Netanyahu? Occasionally tells it like it is; sometimes takes responsibility; fair PM who is sometimes better than average.